An excellent location for the Exhibition Centre. Good accesses to the airport and the shopping and tourist areas of the city. Next to the hill of Montjuic where you can visit the Palau Nacional (Art Museum), the Olympic Stadium, and other places of interest. A luxury hotel at the city’s financial, commercial, and cultural hub. It is the ideal location for business or holiday trips. Paseig de Gràcia with its upmarket boutiques and fashion stores, and the famous landmarks of Barcelona are nearby. A truly luxury hotel! Located steps away from Paseig de Gràcia in an area famous for its shops, cultural and historic attractions, like the Sagrada Familia, Casa Batlló, Las Ramblas, or La Pedrera. Perfect for a memorable stay in Barcelona. A first class hotel in a great location from the renowned hotel chain. Opposite the iconic Agbar Tower and with breathtaking views over Barcelona from the top floors. A Shopping Mall is across the road with cafes and supermarket. Away from the hustle and bustle of Barcelona, in the quiet, yet central district of Sarria-Sant Gervasi. The hotel has its own restaurant, bar, and garage. Free wi-fi is available in the modern, comfortable, and well-appointed rooms. Situated in Raval, one of Barcelona’s most fashionable areas, and its artistic and cultural focus, the hotel has become an integral part of the renewal of the city’s old district, due to its modern and novel architecture, and avant-garde interior decoration. Situated on the sea front next to the International Convention Centre, the hotel’s ideal location makes trips to landmarks easy and time-saving. Admire panoramic views of Barcelona and the Mediterranean, from the comfort of the modern bedrooms. The recently revamped hotel above Sants station, is a few steps from the AVE, and the metro lines. The airport is easily reached by train, or express bus leaving from the station. The major fair halls are within walking distance. In the financial district of Barcelona, with the well-known tourist attractions easily at hand. Fresh seafood can be found by the seaside while enjoying the sunshine. Passeig de Gràcia, for the best shopping in the city is nearby. In the center of the financial district, by the Convention Center and Catalonia’s largest shopping center, the Diagonal Mar. Enjoy the bright and contemporary rooms facing the sea. Unwind by the open-air pool in an attractive terrace. Yards from the beach, with direct access to the Convention Centre. The Diagonal Mar complex with all types of shops, cafes, restaurants, and cinemas is right opposite. Back at the hotel relax by the open-air swimming pool, which has fantastic views of the city. The hotel surprises by its originality and design. Its two high towers are joined by a spectacular panoramic restaurant. The apparent vertical garden blends with palm trees and natural vegetation to make the hotel a genuine natural oasis. With the Sants station and the Barcelona Exhibition centre a short walk away, this is the perfect location for business, and leisure visitors. Besides, all the famous landmarks of the city are reached quickly from the nearby Metro station. In Pedralbes, an historic, and sophisticated residential area of the city, the hotel offers elegant rooms, and a prestigious restaurant. There is an open-air swimming pool. The city centre and the all the famous landmarks of the city are easily reached from the hotel. Comfortable and modern with an ambience of centuries past. In one of the best zones of the city, the Barrio Gótico, near the Cathedral. Close to the fashionable Born area, renowned for its boutiques, restaurants, cafes, and Bohemian lifestyle. In the centre of the city, near Las Ramblas and the port. Trade Fair halls, fashion boutiques, shopping malls, and the city’s foremost entertainment zone, including theaters and the best in night-life, are close by. Modern and trendy, the Ilunion Barcelona is located within the area comprising the Olympic port, and the Forum. This is the hub of the high-technology sector of the city. Close to the beach, it has its own open air pool and exercise gym. Imaginative, the Ilunion Bel Art Hotel is in the Eixample, where Gaudí left his mark with Casa Milà, Casa Batllò, and the famous Sagrada Familia.The hotel is strategically located to move around Barcelona from the two nearby Metro stations. This is a modern and original hotel, with lovely and tastefully designed bedrooms, and an internationally acclaimed Michelin star rated restaurant. Being one of the tallest buildings of Barcelona, it provides breathtaking views of the Mediterranean. Housed in one of the city’s most symbolic buildings, it is conveniently located near the Congress Centre, the largest mall in town, and the nearby beach. The outdoor swimming pool offers amazing all-round views of Barcelona. Centrally located at Las Ramblas, steps away from Plaza Catalunya. The colonial style of this historic property takes you back through time, while enjoying the comforts of a modern 4-star hotel. To relax it has a heated indoor pool and a fitness centre. Located in the major street,“Paral·lel”, that goes from Plaza España to the Port, Paseo Colón, and Las Ramblas. A stroll from the hotel will lead you to some of the favorite tourist attractions. Nearby, buses can take you to the Barcelona beaches. This hotel is elegantly and stylishly fashionable, located in the tranquil residential area of Eixample, where you can find some of Gaudí’s masterpieces: the Sagrada Familia, Casa Batlló, or the Pedrera. There is a fitness room, and free Internet access. Overlooking the city and world-famous monuments such as La Sagrada Familia. A pleasant walk from the hotel is lively Las Ramblas, one of the main arteries of Barcelona and one of the landmarks of the city: a great base for business or leisure stays. Outside the busy tourist area, in an upmarket residential area. All the major attractions, shopping, and trade venues are easily reached by the Barcelona transport system. Modern rooms, a restaurant, and a fitness centre live up to the respected AC label. Close to emblematic sites of Barcelona: La Sagrada Familia, Cuitadella park, Plaza Monumental bullring. Swimming pool, gymnasium, internet zone, restaurant, make it the ideal for young couples or groups of friends who wish to discover the city as never before. In the Eixample, close to La Rambla and Plaza Catalunya, and a leisurely walk to the famous Passeig de Gràcia. Stroll to Gaudí's distinctive works like La Pedrera, Casa Batlló, or Sagrada Familia. Admire the views from the hotel's rooftop by the pool. Contemporary and central hotel. By the Sants train station, which will speed you to the airport, and by a short Metro ride to the lively Ramblas, or to Paseig de Gràcia, the most expensive street in Spain. Barcelona Fira and Convention Center are nearby. Inserted in the area of Passeig de Gràcia and Plaza Catalunya, and a short walk from the Ramblas, this is the perfect hotel to explore the marvels of Barcelona. Some of Gaudi’s architecture are nearby, in the Eixample. There is relaxing a rooftop pool. In the heart of the Eixample. It is near Las Ramblas, Plaza Catalunya, and Passeig de Gràcia. Plaza Espanya and the Barcelona Fira are easy to get to for those traveling on business. Enjoy free wi-fi, the solarium, or the outdoor pool. Originally a 19th century palace, this historic building is just steps away from Passeig de Gràcia, La Rambla and Plaza Catalunya, with easy access to the best-loved tourist attractions: Gaudí’s La Pedrera and Casa Batlló, Las Ramblas, and the Catalan Music Palace. In Barcelona’s dynamic new “Districte de la innovació (22@)”, close to a metro station with direct links to Gaudí’s Sagrada Familia. Dine on seafood and Catalan dishes with the locals at the lively Rambla de Poblenou. Enjoy the nearby beaches. In the quiet El Pla industrial park, 20 minutes by taxi from the main Airport. Central Barcelona is a mere 20 minutes away from the local station, close to the hotel. The Business Corner is open 24 hours a day. Complimentary breakfast and parking. 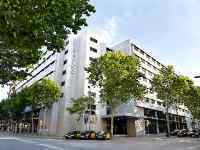 Close to the Port and with good access to the main Sants train station, and the major conference venues near Plaza Espanya, the hotel is perfecly situated for those coming for business, or pleasure. One of the few hotels that accepts small pets. Free wi-fi.